Want free entry? 👍🏻 and @ 5 mates! CLICK GOING TO WIN A $1000 BAR TAB!! 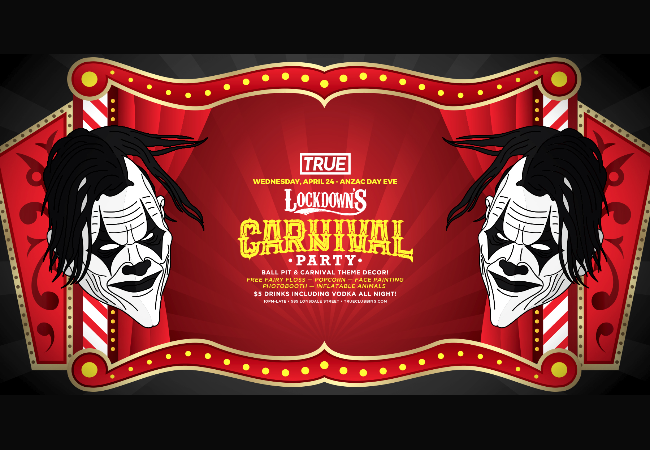 LOCKDOWN'S CARNIVAL PARTY @ TRUE THIS ANZAC DAY EVE! Get down to True on Anzac Day Eve to be apart of the carnival magic with Carnival themed decor, Ball Pit, free Fairy Floss + Popcorn, Facepainting, Photobooth and Inflatable animals! Winner announced on the night at midnight. Dress code: Neat casual. 18+ photo ID required.